Bryan Bell, Chief Data Scientist for Aviso Retention, discusses his journey in Higher Education data analytics to help institutions support student success. Mathematics and statistics were both interests of mine from the beginning of my educational journey, however, like many others I was unsure of what career path I was to follow in order to capitalize on these two disciplines where I excelled. Fortunately, I found opportunity early on in my career to expose these two skills and in turn have grown in my data science-related experiences ever since. I have certainly learned a lot along the way. Diving into (really thrown into) the field as an intern and the residential 'so-called' statistics expert in early 2000, I had to learn quickly how others across the organization view and use statistics and information science. How could workflows be more efficient? Will stakeholders understand the importance of the results? Will they understand how to take action on these results? Will they believe the results? All very important questions that started to shape how I view successful analytic deployments. Following my graduate degree work and internship, I immediately jumped into the world of analyzing consumer behavior charged with answering questions like: What Customer's can we extend credit to? Which customers should we target with what products? Can we identify fraudulent purchasing behaviors within our data? In addition to these questions, many others existed and certainly could have easily outweighed our ability to deliver without a well-rounded data science team with diverse technical and statistical skills. The importance of a well-structured data science team was realized....currently an area where many institutions struggle as they assess external firms or interview for internal teams. By far the most rewarding area of focus from my 15-year data science career has been my work in student success analytics. For the past decade, my work has been solely focused on building custom predictive and prescriptive modeling architectures to inform front-line staff on student risk. While 'predicting' risk can definitely help prioritize workflow and daily student success tasks, prescribing 'action' based upon reviewed student strengths and weaknesses is the most important step you can take in fully implementing student success analytics. This information can inform intervention strategies, talking points and much more, however, in order to take this step the proper software is needed to deliver these critical insights to users in a way that is easily interpreted and acted upon. Derived from my experiences, the primary goal of any data science team focused on student success is to curate, clean and analyze decentralized data to deliver descriptive, predictive and prescriptive insights to institutional managers and staff informing daily action. In order to do so, one must gather the appropriate team, gain institutional buy in and trust across all student success functions and ultimately produce analytic projects that institutional staff can act upon. Historically, we have found aligning efforts of People, Process and Technology must exist to truly impact change on campus. Provided in a Checklist (below) are a few of the items in the areas of talent acquisition, user adoption and the creation of actionable results to assist in designing, delivering and managing student success analytic projects. I will also be attending Educause 2018 – please view the links below for speaking engagements and the opportunity to connect at #EDU2018. Space is very limited, and click the button below to learn more information. The goal of the community group is to promote, educate, and further a network of practitioners with a desire to improve student success through the use of analytics. The more we can collaborate and share on these efforts, the easier it is for these initiatives to grow and succeed. 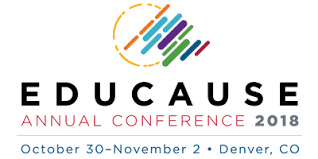 Click below for more information on the SSGA and their meeting at Educause 2018, including information on joining the SSA Community Group. Bryan Bell is available for meetings at Educause 2018. Space is very limited, and remaining available times are offered at the link below.